As I do with every component of a guitar, I want to understand the purpose of the back plate so I can build it in the best way I possibly can. Gore and Gilet’s book Contemporary Acoustic Guitar has been very useful to me (as always) by raising the possibility of building what they call a “live back” – in other words, a back plate that contributes to the overall tone of the instrument by vibrating along with the top when the strings are sounded. This adds a complexity to the tone that wouldn’t be there with a non-live back, so should be desirable. I’m not convinced I have succeeded in this yet. In this page I’m going to show how I make and brace the back plate, and evaluate my current success in the quest for the live back. 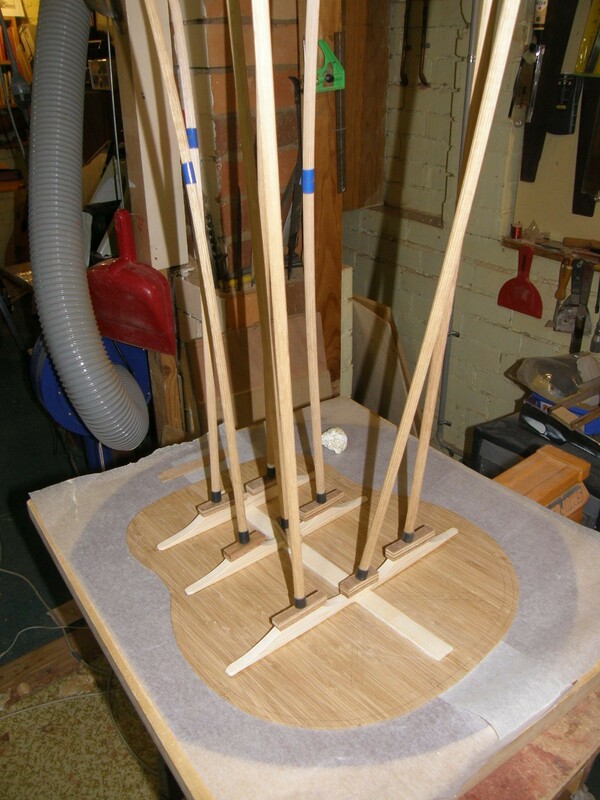 I have adopted the back brace plan used in Trevor Gore’s instruments as a starting point, as you’ll see. At the end of this entry I’ve put some evidence that indicates I haven’t breathed life into my backs just yet. Perhaps I need a thunderstorm and lots of electric arcs and an assistant called Igor. But now I want to show you some test results that have got me thinking more about this concept. What is the purpose of the back plate? The purpose of the back braces has always been seen as mechanical rather than tonal. Thin panels tend not just to flex under load but to distort as they absorb and lose water. Wood always expands much more across the grain than along it, so this can lead to weird shape chances unless stiffly braced. 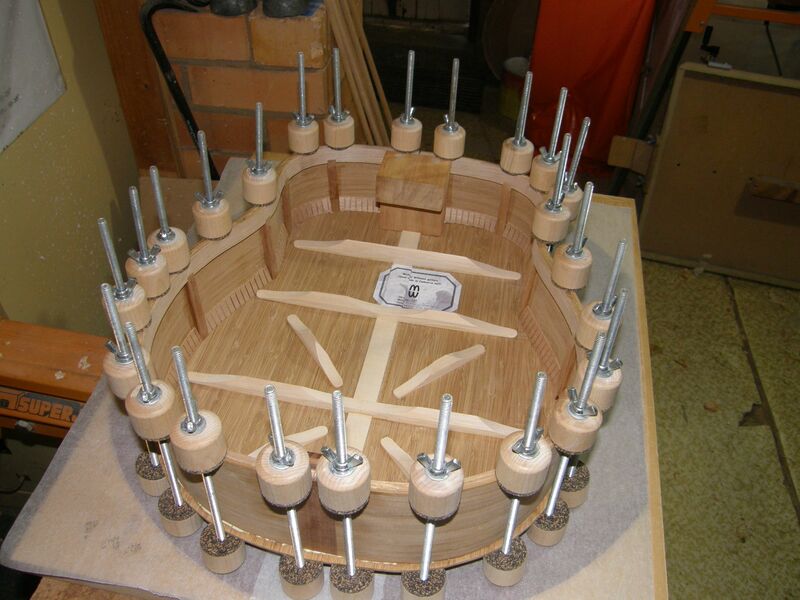 The back centreline join can also be pulled apart by dimensional changes in the wood if the guitar is moved into a dry climate after being built in a humid one. Many people argue that when you play the guitar your body is in contact with the back and damps out all the vibration anyway, so attempting a live back is pointless. This isn’t at all true, as I think I can show you. This simple mode would not exist if the back were not there. It’s as simple as that. The “Breathing” mode is low frequency (usually around 100Hz for a guitar) and contributes bass boom and depth to the sound. But can the back contribute higher modes to the overall guitar sound as well? This is what we mean by “live back”. Can I convincingly show you a live back in action? Sadly, no. But I live in hope…maybe this guitar will achieve it. Stay tuned! What does the back actually do when a guitar is played? This isn’t as simple a question as it sounds. Gore and Gilet’s analysis shows that a soundbox is made up of three separate resonators: the top, the back/sides, and the air contained in the box. Each of these has its own fundamental frequency and an associated string of harmonics or partials, as does every resonator. Here, for example, is the frequency spectrum of a singing wineglass – the highest peak is the fundamental, and the other peaks represent the inevitable series of higher frequency partials produced by different modes of vibration. Where it all becomes complicated is when you start to join simple resonators together, as you do when assembling a guitar. Because they’re connected, each one influences the others, and not in a simple way. Okay, enough physics for now. Let me show you what happens when you start to mess with one out of the three joined soundbox resonators. I’m going to use some data from tapping one of my Jumbo guitars to illustrate. I have kept the original signature (the red line) so you can see the effect of body contact (the black line). Very little at all, wouldn’t you agree? See the difference? Again, I have left the first freely-held response (red line) for comparison. The most striking effect of heavy back damping is the complete disappearance of the first peak in the response, the “breathing” mode. Immobilising the back has broken the link between the three resonators in a dramatic way. The tap sound was an anaemic thunk. 1. Messing with one of the three coupled resonators affects the other two, sometimes dramatically. This understanding opens up possibilities for tuning the soundbox if you know how. 2. The response with the guitar held in the playing position shows very little difference to the guitar held freely – the T(1,1)1 airbody peak is still strongly there. This suggests that the back continues to have a strong influence on sound production when playing, and that the common wisdom (that the player’s body contact completely damps the back and makes it useless to strive for a live back) is emphatically wrong. 3. The “breathing” mode is important to the production of sound by a guitar, and it isn’t there unless there is a back to contain it and importantly that it is free to respond to the strings. When tapping with the back aggressively damped, the tap sound lost its depth and became a rather pathetic thud. This is because with the back immobilised, the box can’t “breathe”. c) I haven’t yet achieved the extra Gore/Gilet step of building a back that further enhances the sound by adding complexity through its own resonant response on top of the “breathing” effect. 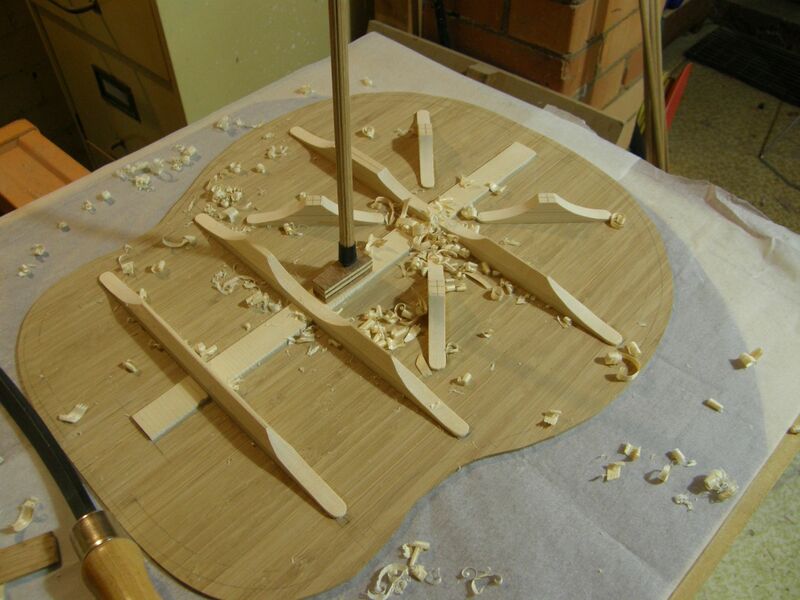 This is the bamboo guitar back nearly finished, showing the Gore-pattern ladder/radial bracing. Here I have been cutting the “gable” with a brace chisel (just visible bottom left). The back is resting is the 20ft radius dish to preserve the curvature as the braces are fitted. 4. attaching the back plate to the sides. 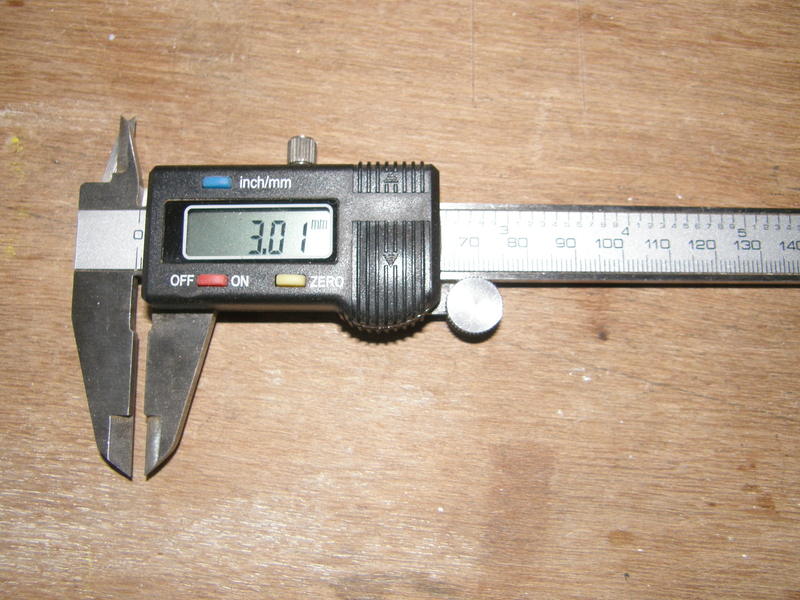 I check the thickness often with vernier calipers. 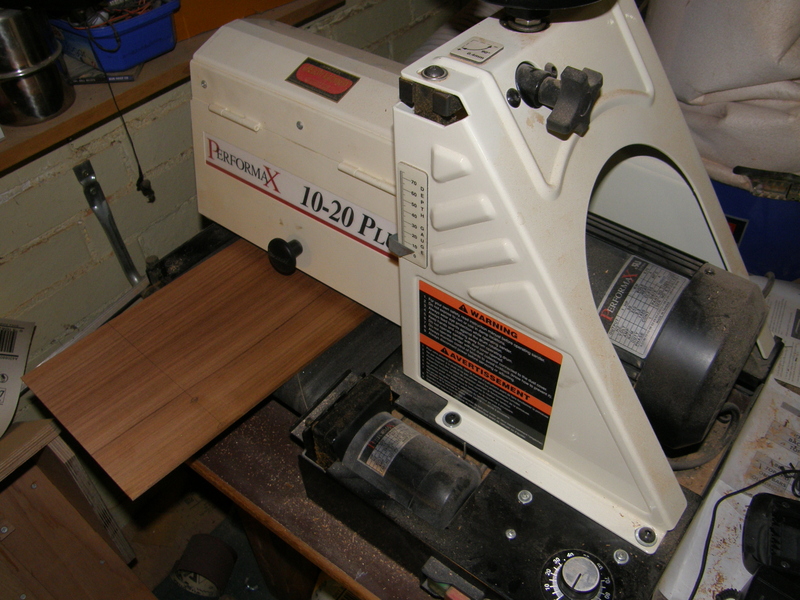 A trick I have learned in using a drum sander is that you don’t need to adjust the drum height for each pass, especially when you’re nearing the thickness you want. This way I can control the thickness to an accuracy of 0.1mm. 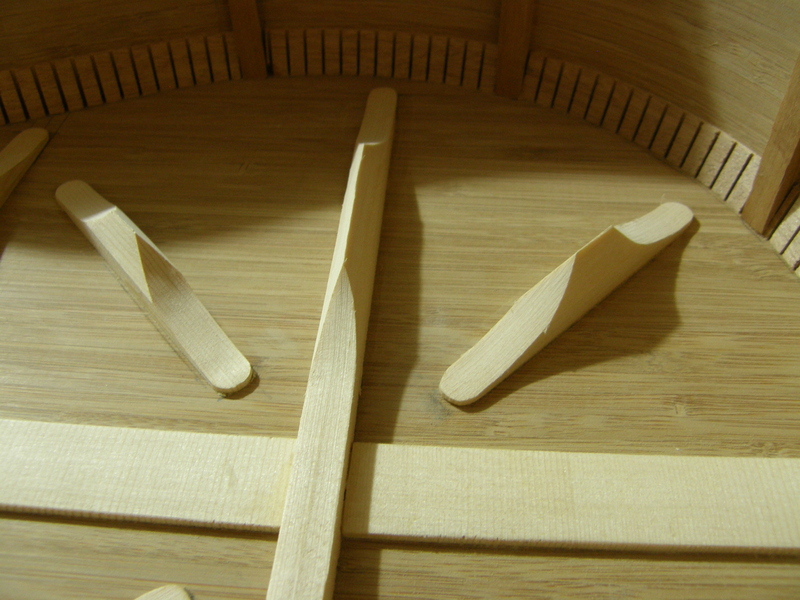 In another page (The bamboo guitar – Part 3) I have explained how I chose what thickness I would work to for the bamboo. 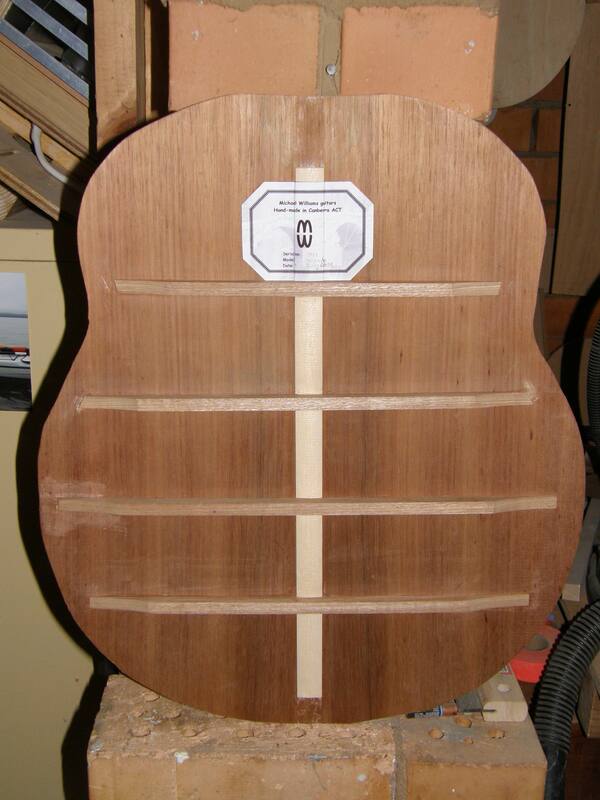 My aim was to produce a back with properties as close to my usual blackwood backs as I could. 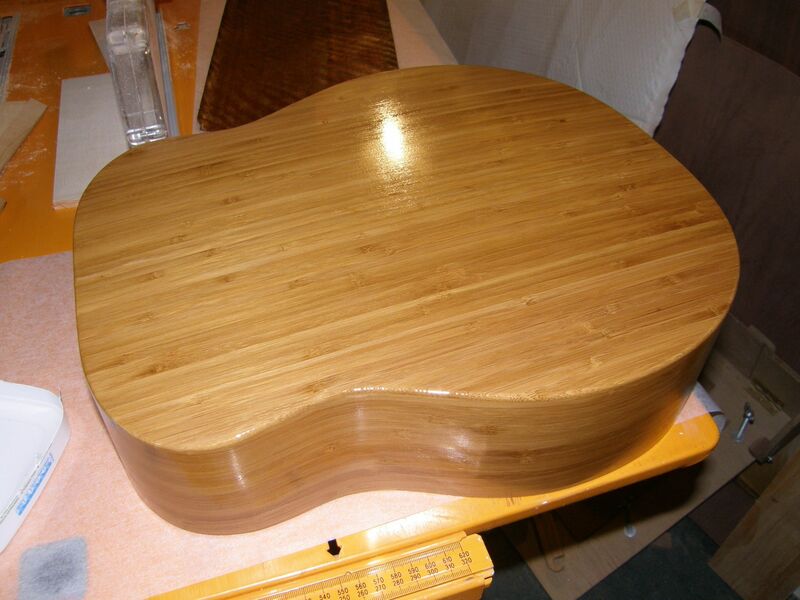 These are actually spruce top panels, but the principle is the same and I forgot to take photos for the bamboo back. The first step is to plane the joining edges straight on a shooting board, then fitting them together on a flat surface to look for gaps. Using an old plane with sandpaper stuck to the sole, with care you can remove the high spots and get an invisible joint. The trick is to get one edge as straight as possible, then adjust the other to fit it. 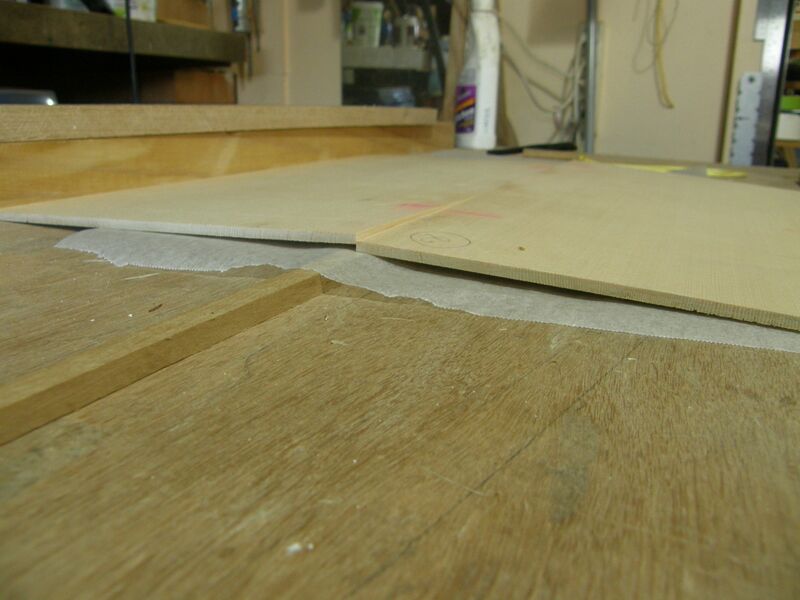 The shooting board allows you to keep the edges square as you work on them. Once you’ve got the edges fitting perfectly, it’s time to join them together. I use a simple but effective setup that I got from somewhere I can’t remember. 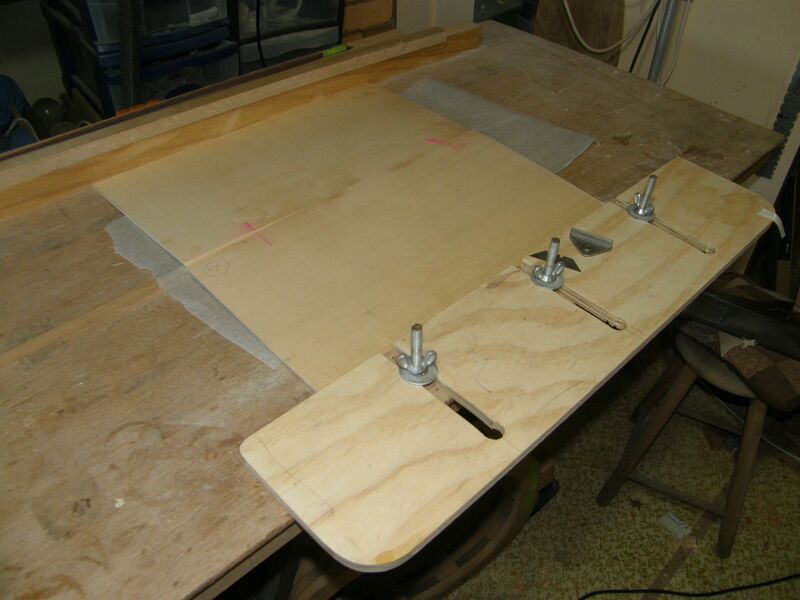 I have a flat table with a batten fixed along each side, one of them adjustable so I can clamp different size pieces. To make sure the panels stay in vertical alignment, I hold the joint down with cork-backed blocks and go-bars. Once the glue is set, you can take the joined back plate out of the clamps, clean up any dried glue, and cut out the correct shape. b) acting as a mould to make sure the back conforms to the right curvature. The marriage strip is glued on and the whole back pressed into the dish using go-bars. Glue is slippery, so keep a sharp eye on the strip to make sure it doesn’t absent- mindedly wander off before the glue grabs. I also make sure that I know exactly where the marriage strip must end to meet the end blocks neatly once the back is glued to the sides. 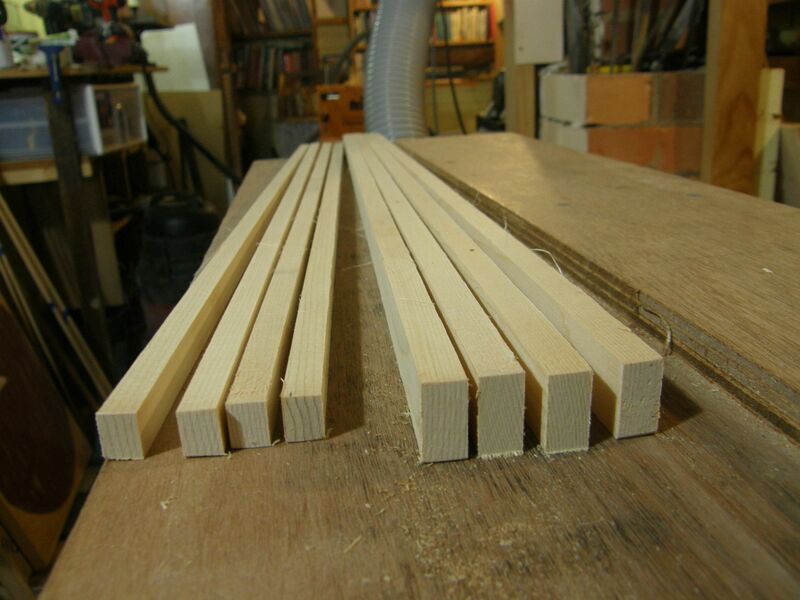 The back brace blanks have already been machined to 20 x 10mm, keeping the grain vertical. I cut each one to length, mark out the scallops, then sand the bottom surfaces to the 20ft curve by rubbing them in the sanding dish, I the cut out the scalloping on my bandsaw and finish them with a small sanding drum in my drill press. I use a sharp X-acto knife to cut through the marriage strip and a sharp chisel to remove wood so the braces can be glued in. The scalloping of the braces reduces the mass of the back, but importantly also allows some later tuning of the back resonances once the guitar is finished. (Remember we’ve found that messing with one of the three resonators will affect both the others.) The general principle is that the thicker the braces the higher the fundamental resonance of the back plate will be. If I want to lower the back resonances later, I can carefully thin down the central scallops working through the soundhole. By the way, the idea that you can tune each brace separately doesn’t work in practice (or even in theory, for that matter – sorry Roger Siminoff) because the back responds as a whole, not a simple sum of its individual parts. Maybe there’s a saying in that somewhere. Finally, I use a very sharp chisel to carve the top edge of each brace at an angle so it comes to a point like a gabled roof. This reduces their mass but pretty much preserves their elasticity. I use cylindrical screw clamps from Stewart-MacDonald (www.stewmac.com). Once the glue has set, I can carefully trim the overlap down and sand the edge so it is smooth and slightly rounded off. Not bad for bamboo, wouldn’t you say? So how will I know if I succeed in producing a live back? The evidence would be there if the spectral signature of the back, or at least parts of it, showed up clearly in the overall signature of the guitar. This sounds simple, but actually isn’t. We’ve seen that the three resonators, the airbody, the top, and the sides/back that make up the soundbox of a guitar, link together as a whole but not in a simple way – each one changes the others in subtle ways. So if they’re linked so intimately, how can we sort out if any part of the overall sound (other than the breathing mode) comes from the back specifically? Can we isolate what the back is up to and compare it to the overall tonal signature? There is a way to decouple the top signature from the back signature: block up the soundhole. This takes the airbody out of the mix because it can’t breath, leaving the top and back much less intimately connected. 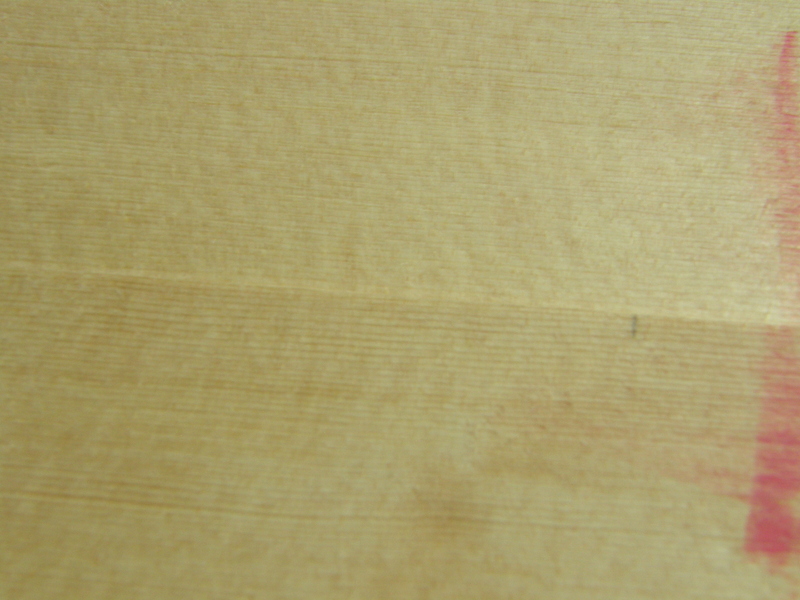 Here is a comparison of the overall tonal signature of the guitar (the top tapped with the soundhole open) – the red line – in the normal playing position. The blue line is as close as we’ll ever get to knowing how the back would respond on its own. What I’m looking for is a convincing overlap between the two, showing that the back is contributing to the overall sound. The outstanding feature of the back response is the peak at 210Hz, and maybe the overall response is higher there as a result. Maybe. The airbody response isn’t present because the soundhole is blocked. Except for a teensy little peak at 175Hz and a fat-looking feature between 210 and 230Hz, I can’t see any convincing evidence that the back is having any influence on the overall sound. Oh, well. 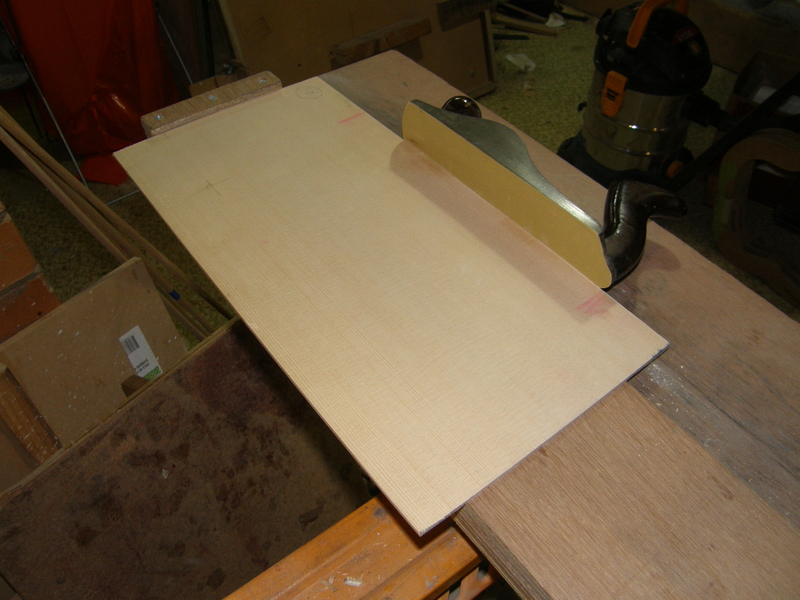 Next I’ll describe making and fitting the top panel, the most crucial element in any guitar.